Over 40 presentations include botanical therapies for iron deficiency anemia, insomnia, bereavement and trauma, joint degeneration, alternatives to the HPV vaccine, autoimmune conditions, chronic fatigue, fibromyalgia, Hashimoto's thyroiditis, Grave's disease, osteoporosis, ADHD and more! 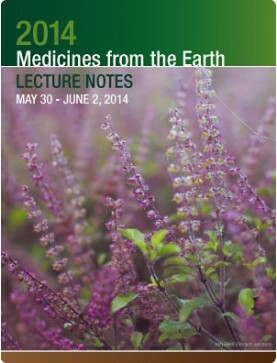 2014 Medicines from the Earth Herb Symposium: Conference Book.Order download of PDF file on this pag..
Panelists: Jill Stansbury and Teresa Boardwine: In the US alone, annual sales on cosmetics..
Speaker: Teresa Boardwine. Wild foraging for our food and medicine has a growing following. Lea..
Speaker: Jason Miller. This lecture outlines thyroid physiology, and the pathophysiology of aut..
Speaker: Amanda McQuade Crawford. Do you have a strong opinion about giving twelve-year-old gir..
Speaker: Walter Crinnion. Arsenic has been in the news a lot lately. It is a known poison which..
Speaker: Kathleen Maier. While these herbs are considered drying, and that is true in many inst..
Speaker: Amanda McQuade Crawford. From the inside out, we explore why the empty space within an..
Speaker: Mark Blumenthal. The chemically complex nature of herbs frequently requires additional..
Speaker: Vickie Shufer. Explore the world of wild greens by tasting the various flavors and how..
Speaker: Jason Miller. This lecture focuses on immune system physiology and follows the steps that l..
Speaker: David Hoffmann. A discussion of traditional uses, published pharmacology, potential cl..
Speaker: Walter Crinnion. Known as the microbiome, the balance of intestinal flora can predict ..
Speaker: Teresa Boardwine. Medicine does not have to taste bad to be good. How do we integrate adapt..
Speaker: Mark Blumenthal. There is compelling evidence supporting the safety and benefit of the..
Speaker: Steven Johnson. Learn how to make and use several basic plant compresses, creams and o..
Speaker: Jason Miller. Explores adrenal fatigue and essence exhaustion as the underlying causes..
Speaker: Walter Crinnion. Continued from Part 1 An intensive review of the association between ..
Speaker: Walter Crinnion. An intensive review of the association between environmental toxicant..